This is a taxi tour that you will visit Asakusa and Kagurazaka in Tokyo. You will rent a beautiful kimono in a traditional Asakusa area, and then you will make wall panels with kimono sash of your choice at Kagurazaka, which has a tranquil, nostalgic atmosphere. Departing from your hotel at 9:00, the first stop is a kimono rental shop in Asakusa, a very traditional area in Tokyo. 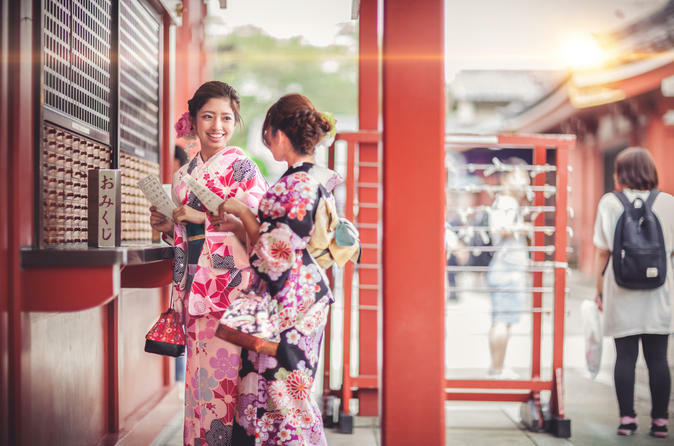 Firstly, select a kimono from a large collection of over 300 patterns and an obi (sash) that matches, then the shop staff help you put on your kimono. A simple hair set is included. After you choose a handbag and sandals, you are now ready to explore Asakusa! There are many attractions in this area: the most famous thing is the large red lantern in the Kaminarimon Gate. Passing through the gate, you will walk along Nakamise shopping street where you will see lots of shops lining up on both sides. This street leads to Asakusa Temple (Senso-ji Temple), a very popular temple among the locals and visitors alike. The next stop is Kagurazaka area. This is a rare chance to make wall panels with genuine kimono sash ("obi") of Nishijin-ori, very traditional, high quality texitle. You will select one or two pieces of fabric, and make two small wall panels (15cm×25cm) by putting the fabric over the wooden panels. This would be a very good, unique souvenier from Japan! After this activity, you will have some free time at Kagurazaka for lunch (cost for lunch is not included in the tour price). You can enjoy strolling this refined, charming and nostalgic area, ideal for photo shooting. After Kagurazaka, it's time to head back to Asakusa to return your kimono. The tour will end at your hotel at around 15:00.